I can hardly walk now, (the next monday) not from running pain, but from the damage the cramp spasms caused me! I think I have sussed out why so many people get cramp on the new course. When its wet, and you are not as fit as you know you should be, and its the longer course, its actually a good 20 mins longer than the old course. Most people are faking it quite a bit already with their training, but add another 10-20 mins, and they are actually way out of their comfort zones. Cramping competitors was pretty rare on the older shorter course. When I exited the bush for the first time (Muritai street [47 mins] ) I was ready to go home, I'd had to stop to re-insert my contact lens, as I had installed it backwards before the race! While I was re-installing it I heard about 20 people pass me, then I grovelled back and passed half of them again.... only to have them repass me on the next downhill ! This was the pattern for the whole race, catch them on the ups, but lose more time on the downs. Very frustrating. Jill Westenra passed me about 20 mins into the race, on a downhill, after I had redone my lens. She was on fire as far as the ladies go. I came out into Wainuiomata and I felt like a dead man. I got through the transition in about 1 min, and looked at my clock, 1.42. So the run splits were like, 47 and 54 ? Getting on the bike was like heaven in comparison to the running. But then the cramp hit me, I could only push the granny gear, thank god most of the bike training I had been doing was on my fixed gear with a 39-16 ratio. I am sure it paid off being able to spin more efficiently. I figured most of the people in front of me were teamsters, but was still surprised at the sheer numbers of them. 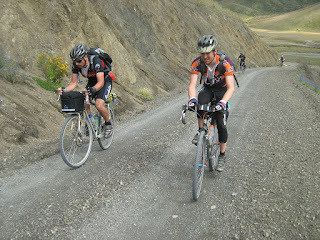 I was impressed to see Matt Harvey (a very strong Masterton Cyclist) pass me on the run. Once on the bike, and going up the roller coaster I started to pull him in, until I had to dismount, and then I couldnt get remounted because of the cramp. I just had to grit my teeth, scream in agony and do it... cripes it hurt. Both calves and left quad simultaneously. You had to ride almost everything, because you knew that if you walked, you might not be able to get back on again. So it was like that the whole way. I crept up behind Matt, saw him take a drink and casually attacked him on the right. I never saw Matt again, but he did win the open mens Du! So I was a 3.50, and I think Matt was a 3.53 or something. Probably the most impressive Du result came from Marco Renalli, with a 3.56. 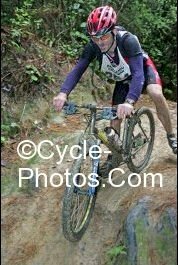 50 years old and the 2nd fastest MTB split by less than a minute! So what about the cramp? Whats the answer? There really are only a couple of answers. 3. Dont do such a long race!